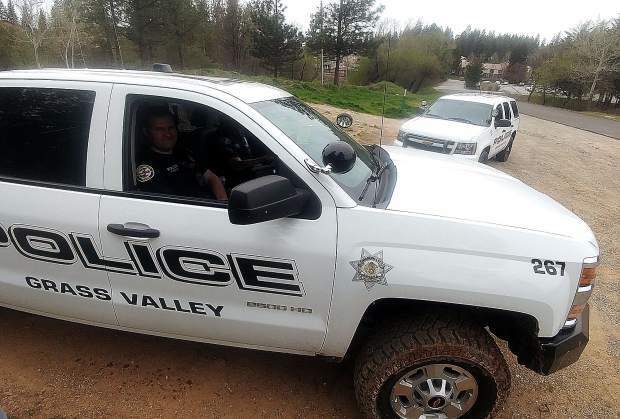 Grass Valley Police Officers Blake and Sgt. Perry, leave the homeless camps off of Plaza Drive after providing citations to the residents. Police have noted a rise in encampments in the Plaza Drive area of the Glenbrook Basin. First responders dealt with a heroin overdose from the same area Wednesday night, and made an arrest Thursday morning. Grass Valley Police Officer Tyler Blake and Sgt. Jason Perry leave the homeless camps near Plaza Drive after providing citations to the residents. Police have noted a rise in encampments in the Plaza Drive area of the Glenbrook Basin. First responders dealt with a heroin overdose from the same area Wednesday night and made an arrest Thursday morning.